In the Revised Common Lectionary, the Transfiguration story is always read on the last Sunday of Epiphanytide. Since Ash Wednesday comes immediately after, many congregations also “bury Alleluias” on this day, setting aside this special celebratory word which shall not be spoken nor sung in worship until the Great Vigil of Easter. In some congregations, the word on a banner or carried by a straw figure is placed in a box, or even, literally, buried. In 1296, Bishop William Duranti wrote: "We desist from saying 'Alleluia', the song chanted by angels, because we have been excluded from the company of the angels on account of Adam's sin. In the Babylon of our earthly life we sit by the streams, weeping as we remember Sion. For as the children of Israel in an alien land hung their harps upon the willows, so we too must forget the Alleluia song in the season of sadness, of penance, and bitterness of heart." The prayer and the hymn posted here are both intended to help congregations celebrate the “burying” of alleluias as part of the Transfiguration liturgy. 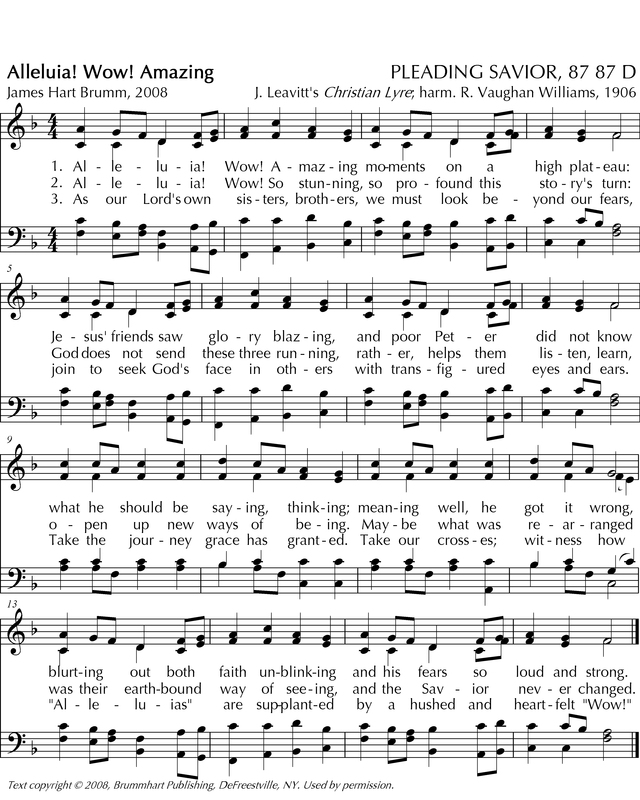 There is another hymn, “When we proclaim Christ as God’s Son,” which is found in Rhythms of Praises: Hymn Texts by James Hart Brumm, published by Wayne Leupold Editions. Where the “Alleluias” are completely in upper case, they should be shouted; where entirely in lower case, they should be whispered. In the midst of life with you, we see the glory of your appearing. let us give thanks for God’s blessings In our life . . .
As our Lord did with Peter, Christ startles us out of our slumber. Like Peter, we sometimes think our Savior is in need of our help. let us pray for Christ’s holy Church . . .
knowing whoever is not against us is for us. into great crowds with great needs. but, if we lose our life for Christ, we will be saved. we know that the Son God gave us is to be betrayed. let us pray for all the people of this world . . .
let us pray for those who lay down their lives . . .
May everyone who sees us be astounded in the greatness of God. and take up our own crosses. Help us deny ourselves as you denied yourself. Help us leave behind all that keeps us from seeing your glory. Help us be faithful on the lonely Lenten road. and the unbridled joy of Resurrection.